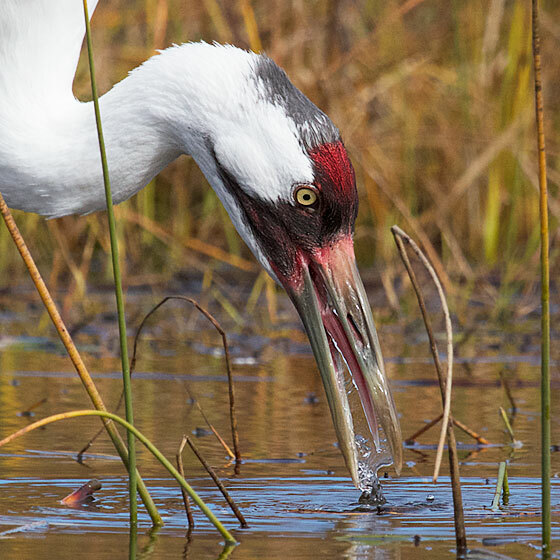 Whooping Cranes will eat just about anything that grows in a marsh — big insects, tubers, crabs, fish, frogs, and wet mice. It's hard to tell what this bird is getting, but I'm sure it is delicious. I can almost taste it! We're winning this one. We almost lost our most magnificent cranes when they got down to a flock of 21 birds, in the 1940s. Thanks to the International Crane Foundation and other conservation organizations, there are now 600 Whooping Cranes probing for treats in North American wetlands. I've seen wild Whooping Cranes at a distance, but this was up close. The cranes at ICF have a huge enclosure, with a marsh. That makes me feel better, if not completely OK, about the cranes being in captivity. 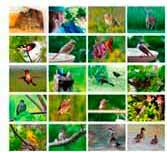 These captive birds do breed, and their chicks get released, to help build up the wild population. 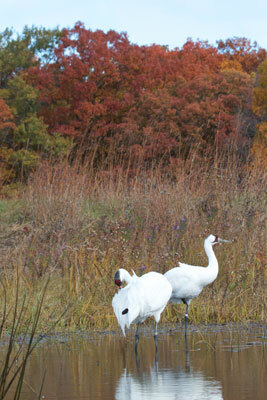 Whooping Cranes are still endangered, but they are recovering. A far better situation than some species of cranes have in other parts of the world. 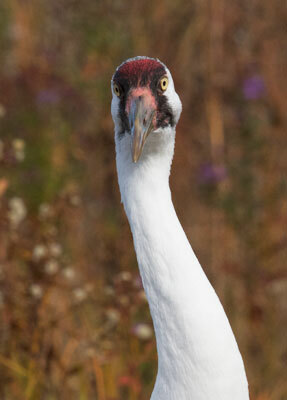 You can watch a neat video about how one man worked to save the Whooping Cranes. It includes footage of George Archibald dancing with Tex to bring her into physiological breeding condition. Usually a male crane does the courting, but Tex thought she was a human because of the way she was raised, and only a human man turned her on. Not just any man, either. George wooed her and won her, and she loved George only. 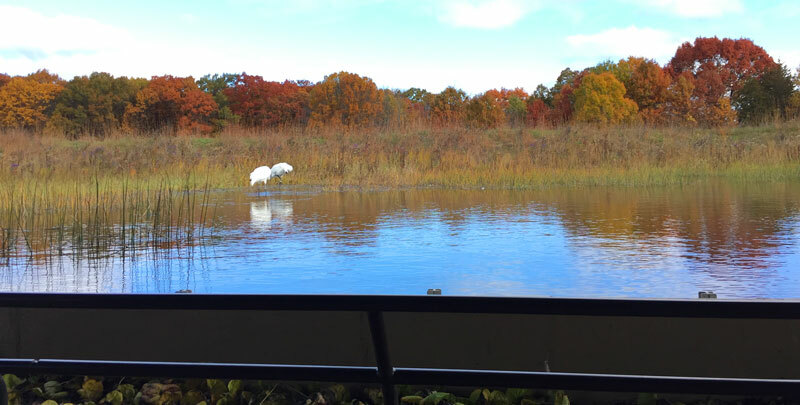 One of the Whooping Cranes in these photos is a descendent of that first bird, Tex, at the International Crane Foundation. Staying close Whatcha lookin at? The International Crane Foundation works to help save the cranes in the lands where they are native. The Foundation is also working to educate the public about cranes. One of their programs lets people see all 15 species at the center in Wisconsin. It's worth visiting. But be warned. You'll come away caring about what happens to the cranes of the world. Photos © 2014 Diane Porter. All rights reserved.